The eighties was a seminal decade and where it really shone was on the silver screen. Iconic characters and groundbreaking franchises were born, and while some films have stood the test of time, others require rose-tinted glasses to see their original beauty. 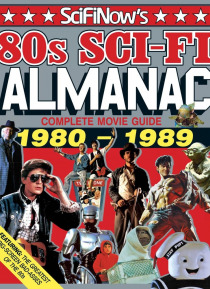 In this book we take you on a journey through the movies that defined a generation. From Back to the Future and The Shining to Return Of The… Jedi and The Terminator, enjoy the films that made this one of the greatest decades of cinema. Featuring: 15 greatest big screen bad-asses of the 1980s - The biggest of the 80s SciFi bad-asses. Ghostbusters - Your complete guide to the classic comedy. Who you gonna call? Back to the Future - Jump in the Delorean with Doc Brown and Marty McFly. Evil Dead - Take a terrifying trip to the woods.